While the City of Edmonton Historic Resource Management Program is primarily focused on the conservation of Edmonton's built historic resources, the City recognizes that these buildings have a story to tell or an activity that occurred in them. These stories, songs, or activities make up an very important part of Edmonton's heritage, that is not a physical reminder of the past (like our buildings) but an intangible connection to Edmonton and Alberta's rich history. The City of Edmonton Planning and Development Department, in cooperation with the Heritage Foundation of Newfoundland and Labrador, is pleased to present a half day workshop on Intangible Cultural Heritage. The workshop will be lead by Dale Jarvis, a well known storyteller, author and folklorist who currently serves as the Intangible Cultural Heritage Officer with the Heritage Foundation of Newfoundland and Labrador. 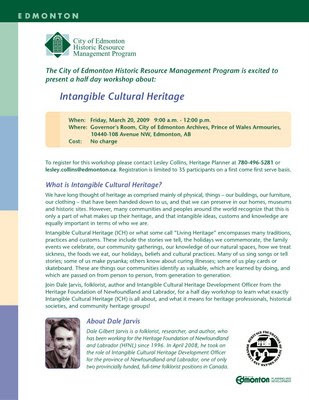 Dale will guide participants through an overview of intangible cultural heritage, help brainstorm some of Edmonton's unique intangible cultural heritage and provide the City with some strategies for protecting and documenting these important connections to our past.